digital studies – I hope from Ian Hattwick on Vimeo. digital studies – little from Ian Hattwick on Vimeo. Please from Ian Hattwick on Vimeo. Rachel Bittner, Alex Curtis, Dexter Stevens, and myself after the premier of the digital studies. We all live in the digital age; how has this affected our essential humanity? Digital technology has infiltrated more than just the physical world. Our thought processes incorporate data structuring and processing techniques that were unthought of fifty years ago. How does this affect our spiritual and emotional selves? Digital Studies addresses these issues through the exploration of digital information processing through the medium of a wind quartet chamber ensemble. The primary concepts explored are binary representations of words with personal meaning, and the use of data arrays to structure information. Binary information can be as simple as 0-1, or on/ off. Yet it can also be used to represent sophisticated concepts. This parallels the ability of musical notation to represent abstract concepts. Digital Studies explores both of these avenues- exploring both the duality inherent in musical ensemble performance, and also translating binary representations of human constructs (Hope, Please, Little) to musical phrases and ideas. The most important concept portrayed in Digital Studies is the fact that digital information is only a tool in the hands of human consciousness. No matter how information is generated or structured, it is always filtered through the humanity of the user. Perhaps this is the biggest binary of all- the human mind and it’s tools for self-expression. 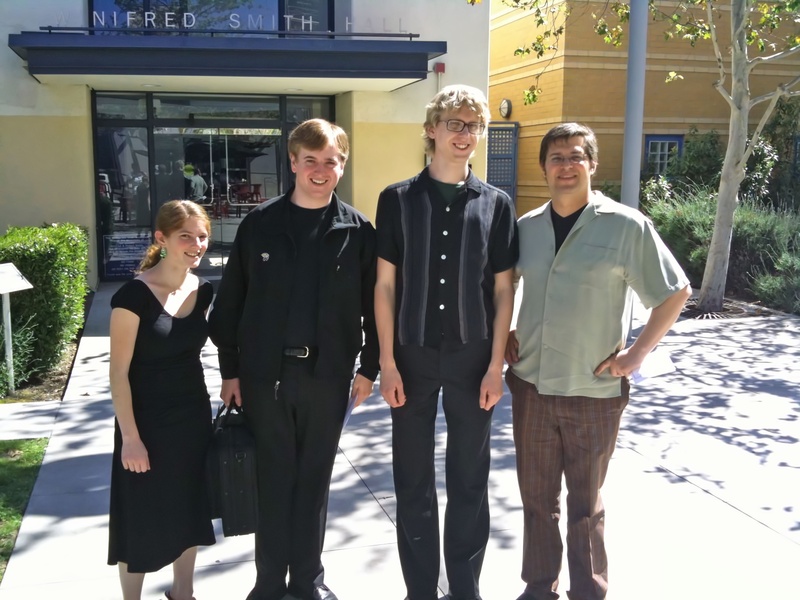 Recorded March 17, 2010 at the UCI Chamber Music Final Concert. Special thanks to Maggie Parkins and Chris Dobrian. Thanks to Christian Wimmer, who rehearsed all quarter but wasn’t able to make the final concert, and to Alex Rosales for filling in for him.